Having a baby is a life-changing experience for everyone involved, including your client’s pets. Just as they’re preparing for baby’s arrival, their dog needs advance preparation for this big change, especially if their dog has not spent time around children. With so much incorrect information available via Dr. Google we have to remember that our clients simply don’t know any better. I’ll never forget the hysterical phone call I received from an expectant parent who read to show their dog that the baby was dominant and to use the baby blanket to pin the dog down. The story continues that the parent pinned the dog down, was bitten and was now terrified that the dog was definitely going to bite the baby. What a great opportunity for open education! We talked all about body language and the series his dog went through prior to actually biting. After all, we know that dog bites don’t happen out of nowhere but the recognition of those clues isn’t nearly as natural for our clients. In fact, according to the National Canine Research Council, there are many factors that were present in more than 80% of cases. Notice I said many, four or more to be exact. For me, that’s terrifying! the owner’s abuse or neglect of the dog. Working in an animal shelter, I see dogs surrendered for a variety of reasons. 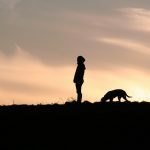 I’ve had couples who were still experiencing their own unresolved trauma from witnessing or experiencing a dog bite. Now that they are expecting, they are too paralyzed with fear to think clearly. I’ve also had folks describe watching their dogs interact with the baby through the monitor screen and thinking that meant they were supervising appropriately. Once the bond has been broken and the dog is on our doorstep; it’s too late for education. We need to catch the family in their vet’s office and guide them to an experienced behavior professional. Help clients start preparing their pet now for baby’s arrival to create a safe and happy environment for everyone, and establish the start of a lifelong bond between their new baby and canine companion. Here are some easy, practical tips to start educating and supporting your expectant parents. Know how their dog reacts. Watch for signs that their dog is nervous or scared by looking at the position of their eyes, ears, tail and muzzle. Think about how their dog reacts to different situations, sights, sounds, smells and touch. For example, does their dog show fear when guests come to their house or get nervous when you rearrange furniture? How their dog reacts to these types of experiences can provide insight into how they may respond to having a new infant in the home. Introduce new sights and sounds before baby arrives. Think about what sounds, like fireworks, make their dog nervous or scared. Their dog may have a similar reaction to a baby’s cry. Play a CD or audio of baby sounds and slowly increase the volume over time to help familiarize their dog with these new sounds. It’s also a good idea to set up baby equipment like the crib and swing early to give their dog time to investigate and adjust to these new sights. Create positive associations with baby’s scent. Have dad or a familiar family member bring the hospital blanket home so their dog can sniff their baby’s scent and build a positive bond with this new smell. Reward their dog with a special treat for being curious about the blanket and investigating it in a calm way. Put some of the lotion or oil you will use with the baby on the baby equipment to familiarize their dog with the scent. Brush up on their dog’s cues. Strengthen their dog’s obedience cues, like sit, down, wait, or go to bed. Make sure their dog can respond to these cues both verbally and from a distance so they can follow even when their hands are full with the baby. Carry a doll around the house to see how their dog reacts when their hands are full. Get their dog used to a flexible schedule. Once baby arrives, parents won’t always be able to stick to their dog’s regular feeding and walking schedule, so get them used to eating or walking at different times. Have the couple introduce their dog to the person who will feed and walk them while they’re in the hospital. When returning home, mom should greet the dog first and alone. When mom and baby first come home from the hospital, mom should go inside by herself for a few minutes. Mom’s been gone for a few days so their dog will be excited to see her. Once they bring the baby inside, don’t force an interaction with the dog, but do invite their dog over for a sniff and reward calm, quiet behavior. Practice active supervision. Don’t rely on the baby monitor when they’re home with their baby and their dog. An awake adult should supervise at all times. If they’re napping, their dog should be gated, crated, or tethered away from the baby. And if baby is sleeping in the crib, close the nursery room door. Be careful taking family walks. Again, know their dog’s behavior. If their dog likes to chase squirrels or bark at other dogs while on a walk, parents may not want to attempt a solo walk with their dog and stroller. Practice walking their dog with an empty stroller or walk with two adults present to keep everyone safe and on course. Teach their dog boundaries. It’s important for their dog to know what behavior is expected around the baby. Let their dog sniff baby’s toes, but not baby’s face. Reward their dog for calm and quiet behavior around the baby, and ignore unwanted behavior. Think about how their dog gets their attention now. Do they whine, bark or hit you with their paw? Parents should starting teaching their dog how to get their attention in a more appropriate way. Teach young children how to greet a dog. It’s ok to tell children that a dog would rather not say hello! There is a whole program called; “Be a Tree” that teaches children how to handle a strange dog approaching them but what about a child approaching a dog? I teach children to stop and ask. If the parent gives permission, have the child look at their feet and tap their leg. We just gave the dog a choice to say hello and walk away. Remember, invites decrease bites! One of the most rewarding parts of my job is networking with local Veterinarians! I love consulting on various cases while we address the medical and behavior needs of our patients. I have the added bonus of spending an hour with the patient, in their home, and reporting my observations back to their Veterinarian. I believe it is everyone’s responsibility to help create dog aware generations and the larger our team is; the more we can support our clients! We can all help keep dogs and babies safe while creating a lifelong bond and easing the transition for our clients. SPCA Tampa Bay’s Dogs & Storks program is the first program in the nation that provides positive, practical and fun solutions to help families with dogs prepare for baby before baby arrives. Please visit www.spcatampabay.org/dog-training for more information. To find a Family Paws Parent Educator in your area, visit www.familypaws.com.